Christmas with a Hastings Gift Card - It's all wrapped up! | Food NI - Our Food So Good! Christmas with a Hastings Gift Card – It’s all wrapped up! Searching for the perfect gift this Christmas? Then look no further than a Hastings Hotels Gift Card. Hastings Hotels Gift Cards can be used to experience a luxurious overnight break, sample award-winning afternoon teas, or indulge with a relaxing spa treatment. View the Hastings collection of six luxurious hotels across Northern Ireland at www.hastingshotels.com. 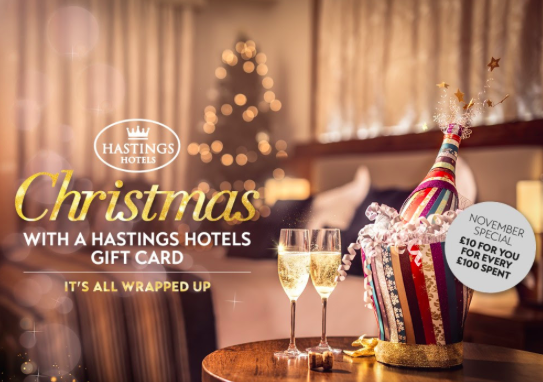 Purchase a Gift Card this November, and for every £100 spent, you will receive an additional £10 voucher to spend in any of the Hastings Hotels.